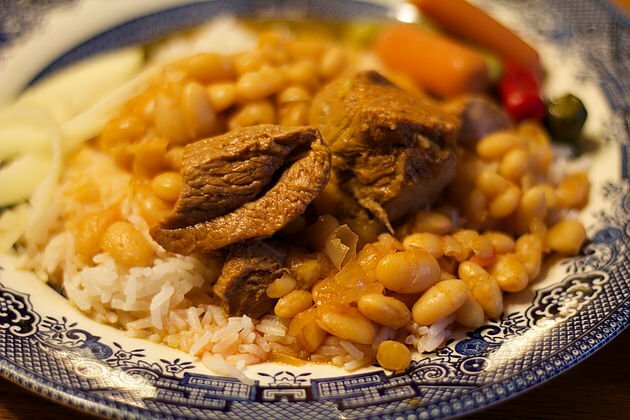 When I was younger, one of my favorite foods was this bean stew with lamb (known as “masheh” in Assyrian). I can still remember coming home from school and trying to guess what was for dinner based on the aroma coming from the kitchen. 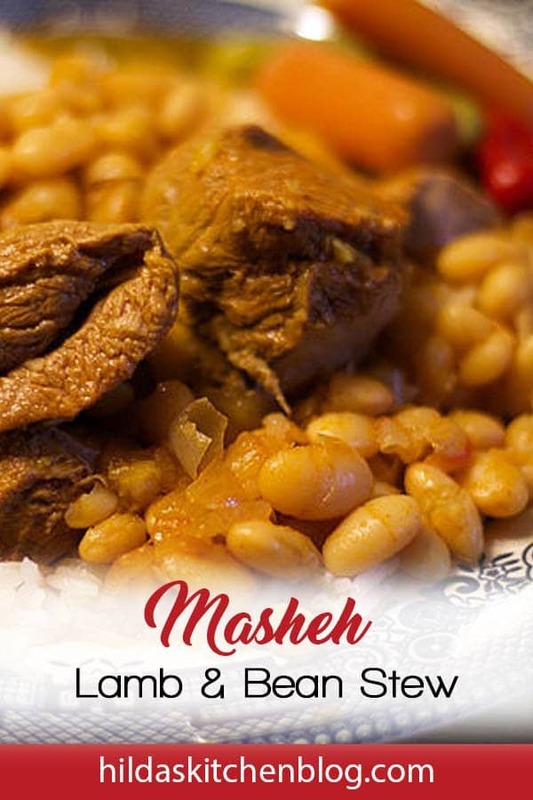 I was always excited when “masheh” was on the menu! I’m not sure why I don’t cook this bean stew more often, but it’s probably because I’m always on a diet, counting carbs, and avoiding rice like the plague. Today I decided to live a little; I invite you to do the same. After all, life is too short to never eat your favorite food! 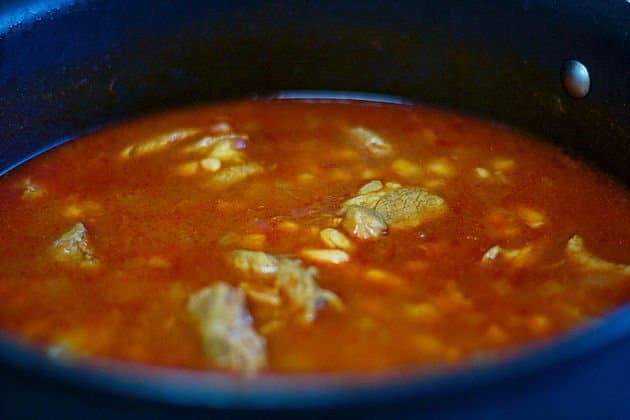 In the Middle East, stews are cooked almost daily. The various stews have these ingredients in common: meat, tomato paste, onion, salt, and paprika. You’ll notice that a lot of the recipes call for lamb. However, if you don’t like lamb, you can easily use beef as a substitute. So, how do these stews differ? Well, that would depend on the vegetable or legume being added to the stew. Some of the possibilities include okra, green beans, zucchini, peas, eggplant, and potatoes. Basically, whatever is in season, or in stock. We sure are spoiled in this beautiful country of ours. We can drive two minutes to our local grocery store and have an endless supply of ingredients to cook with. Mom sure didn’t have that luxury in Iraq! Maybe that’s what made her such an amazing cook, she had to get creative. Bean stew is traditionally served with either plain white rice, or Vermicelli Rice. You will always find a bowl of “jilaleh” or “herbs” at an Assyrian table. Herbs like mint, basil, parsley, and cilantro are included in this bowl. Besides herbs, scallions, radishes, and cucumbers are also added to the mix. It is customary to eat this mix along with the main meal. Pickles are also served alongside most meals. Besides rice, you can also tear chunks of bread, add them to a bowl, then smother the bread with the stew. Of course, if you are watching your carbs, I don’t recommend that option. Simply eat the bowl of stew by itself. Bean and lamb stew, rice, and a side of herbs. Picture borrowed from a friend’s Facebook page. You may also like the following Assyrian recipes: Okra Stew (Masheh), Meatball Stew (Chipteh), and Kubba Hamouth. 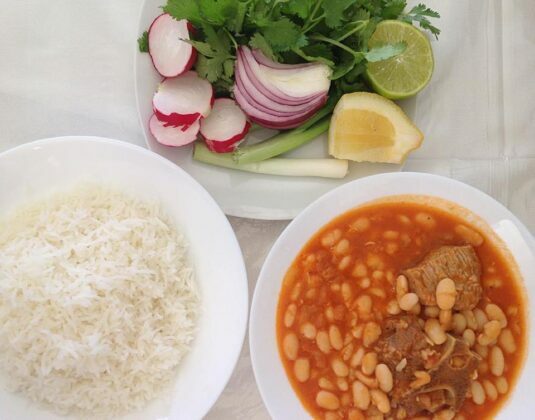 Assyrian Bean Stew with Lamb, called "Masheh" in Assyrian. It's usually served over white rice, or eaten with bread. The night prior to making this stew, pick over the beans, getting rid of any foreign matter. Add the beans to a large bowl and completely cover with water. Set aside until the next day. Rinse meat under running water, and drain. Add to a six quart Dutch oven. Strain the beans and add to the same pot. Cover with six cups of water and bring to a boil, uncovered. ​When foam rises to the surface, pour the contents of the pot in a strainer. Rinse the meat and beans, and place back into the pot. Add six to seven cups of fresh water. Cover, and cook over low heat, for 1-1/2 hours. Meanwhile, add the oil to a medium-sized pan, and sauté the diced onion until soft and translucent. Add paprika, cayenne, and tomato paste to the saucepan. Stir in approximately one cup of water. Set aside until the beans are ready. Once the beans and meat have cooked for an hour and a half, stir in the contents of the pan. 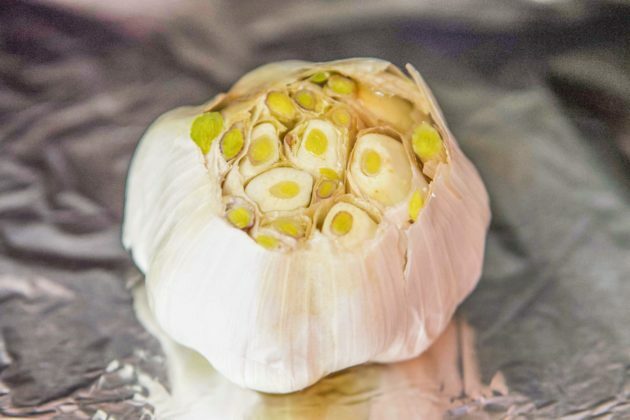 Add the salt and garlic. Cover and cook over low heat for an additional 30 minutes, or until the beans are tender. The longer you cook the stew, the better it will taste! Serve the stew over plain white rice, or use my vermicelli rice recipe. Hi Donna, Thanks for your comment! I’ve never heard of using oatmeal instead of barley before, that’s very interesting. There are some slight differences in the way food is prepared between Iraqi Assyrians and Assyrians from Iran. 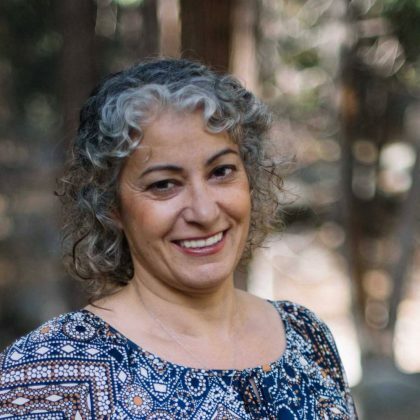 Although my mom was born in Iran, she grew up in Iraq, so most of our food has an Iraqi influence. Delicious either way!